-A mix of songs spanning Ira Gershwin, Cole Porter, and Jimmy Van Heusen, Billy Joel and Carole King. NICK ZIOBRO, 20, and JULIA GOODWIN, 18, were each crowned NATIONAL WINNERS of "MICHAEL FEINSTEIN'S Great American Songbook Vocal Competition" at the tender age of 15 years old. Since winning, they have teamed up and are exciting audiences around the world...garnering a host of AMAZING reviews along the way! They have graced the stages of Carnegie Hall, The Kennedy Center and performed with the Pasadena Pops Orchestra and Feinstein's/54 Below, to name just a few. 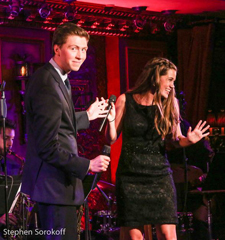 AMAZING REVIEWS FROM MICHAEL FEINSTEIN: NICK ZIOBRO "is the kind of talent that comes along once in a lifetime!" JULIA GOODWIN "is an incredibly talented musical phenomenon!" NICK AND JULIA will bring the creme de la creme to any event, performing Classics from The Great American Songbook, Pop Hits and much more. Available to book with Quintet to Big Band Engagements, Performing Arts Centre Theatre Presentations or Symphonic Events, Corporates and Privates.